October 18 - Kora finds a home! Kora is a beautiful 2-year-old German Shepherd Dog who was imported from Germany and started in Schutzhund. Schutzhund is a sport that includes three areas of training: obedience, tracking and protection. To find out more about Schutzhund, click here. I’ve had the pleasure of meeting this very sweet dog. She has been turned over to Chapter 2 Rescue organization to ensure that she gets the care and help she needs to be placed in the right home. Since I know a little bit about German Shepherd Dogs (I have four living in my house right now, one is supervising me as I write this...) and Schutzhund is a sport I’ve (or more accurately two of my dogs have) participated in in the past, I’ve taken a special interest in working with this dog until a proper home can be found. Kora is underweight and is beginning to show the subtle signs of stress from being bounced for foster home to foster home. However, she passed the SAFER test when she was originally turned over to the shelter in South Dakota. Pretty amazing considering she's so thin and still passed having an "assess-a-hand" shoved in her food bowl. Given all she’s been through she is handling things pretty well. We would like to find her a home sooner rather than later and structured training will be a requirement for her adoption. Kora needs to go to a home who knows something about working dogs. She would be best in a home that is involved in canine sports, like Schutzhund, PSA (Protection Sports of America), competition obedience or tracking. She might even like herding although she has not been tested around sheep. If you know anyone who is an experienced handler and is very involved in their dog sports, Kora would be an excellent dog to consider… no puppy antics, no waiting until she gets her adult teeth to do bite work, just a sweet and focused dog with excellent toy drive and a need to work. Please forward this information on. To find out more about Kora call Marilyn at 952-226-2622 or Max at (952) 442-5155. Kora deserves a second chance. If you are interested in adopting her, application can be made through Chapter 2 rescue. (See other Chapter 2 dogs and contact information here.) You can also make a financial donation to help with her care while she is in rescue. We will have a donation site posted on this website shortly. Please check back to find out more about her story and her progress. I stayed late after my obedience class went home for the evening to play with Kora. She LOVES chasing a ball and playing fetch. She knows a lot of commands and tonight we worked a little on TOUCH, but really all she wanted to do was have a little human interaction and play. She has so much energy that she doesn’t have the opportunity to expend in her current environment! I’m glad I was able to allow her to enjoy and be a “happy dog” if only for just a few brief moments. I suspect Kora has been started on tracking, because when her leash is under leg she is nose-to-the-ground! Even when no track has been laid… she goes right to work to try to determine what track she is supposed to be following. It’s amazing to see such a fabulous dog do what she was born to do. It’s a shame that not long ago she was on death row with only hours to live. Chapter 2 Rescue is truly her lifesaver. But we need to find her a family of her own. What a beautiful day! I wrangled up some friends and headed out to Minnewashta Regional Park for a canicross hike. It was a great opportunity to spring Kora from her kennel and current foster home at VIP Pet Services and let her ‘PULL’ off some energy. Canicross is the dog-powered sport whereby the dog is fitted with a special harness (same as those used for skijoring) and attached by a 6-foot bungee line to a special belt fitted around the handler’s hips. At first Kora was all energy. Sadly, although she gets awesome care and an hour of play and attention at VIP, she doesn’t get her working dog needs met. Until she lands herself in a “real home” with people who understand her desire to be part of the family and be a contributing, working member of the household, she is ‘stuck’ in the mind-numbing routine of life in foster care. So when she first got to the park she was all energy! But soon enough she settled into the pulling routine and eventually we were able to move away from our 4-dog single file formation into a group of dogs pulling side-by-side out front of their handlers on a nice leisurely (“leisurely” for being pulled by dogs!) pace through the various trails on this beautiful Minnesota autumn day. By the end of the hike Kora seemed to really be enjoying herself and was soliciting attention enjoying her interaction with people. 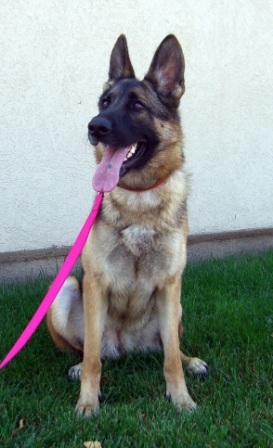 She is such a good dog and so wants a family to call her own… She is at first, aloof, as is the German Shepherd breed. But it doesn’t take long to see that she also desires to fulfill that other characteristic German Shepherds are so highly valued for – loyalty. It broke my heart to have to return her to the boarding kennel that she must call home for now. Tomorrow I plan to take both Kora and Truman for another canicross hike. Hopefully, soon, Kora will get to go to her real home at the end of her hikes. If you know anyone who might be a good match for Kora and has room in their heart and home for this lovely girl, please have them read this and contact Max (952) 442-5155 or Marilyn (952-226-2622) for more information. Please note the 'annoying whining' on this video is actually not coming from Kora, but from another German Shepherd dog who was along for the walk and very frustrated that he was not the center of attention! My friend, Hope, came all the way over to the western ‘burbs from St. Paul to help handle Truman, the pit bull terrier, while I hiked with Kora today. It was another beautiful autumn day and these two dogs really enjoyed being able to get out in the sun for a 2 ½ hour hike at the regional park. Kora had to sniff EVERYTHING! Today it was only Hope and I on the trail so with the lack of other seasoned canicross dogs, Kora had a little trouble remembering what the sport was all about – PULLING! But who could blame her? After all, as far as we know only yesterday was her first experience with the sport. Truman knew what to do though, so once we put him up front, Kora was on! Eventually we managed to have them both walking side-by side. Occasionally Kora got a little feisty, but nothing an experienced handler couldn’t deal with. Kora loves our little breaks at the water and has no problem wading out to grab a mouthful of cool refreshment. Kora is very food motivated (she likes her balls, too)! Hope and I both had duck treats in our pockets and Kora was happy to let us know that she knew exactly where the good stuff was! Given a little practice I bet she could steal the snacks right out of my breast pocket! After about 20 minutes Kora shifts from independence to looking for approval and guidance. I know I keep typing the same thing over and over again, but she is just looking for someone to give her loyalty to! Kora was adopted this evening. Hopefully I will have more information to share on this soon. Although I'm glad she has found a home with a working dog family who will work her in her favorite sport - Schutzhund - and give her the love and care she needs, I'm sad that I didn't get to say an official good-bye to her! Stay tuned there is more to know about this story and it will be posted shortly! and you will know each other. you will not know them. And what you do not know you will fear. What one fears, one destroys.